Claire is a three year old fawn female pug that was surrendered to an animal shelter by her owners because they could no longer care for her. She has been spayed, vaccinated, dewormed and tested negative for heartworm. Claire is a very sweet, friendly little pug that loves to play with the other dogs at her foster home and also gets along well with cats. It is not known whether or not Claire has been exposed to children before, but given her personality she would probably do well with kids, especially older children. Her favorite activities outside of playtime include chewing on rawhides and snuggling up to people on the couch. She is potty trained as well as crate trained and is currently working on her leash training. 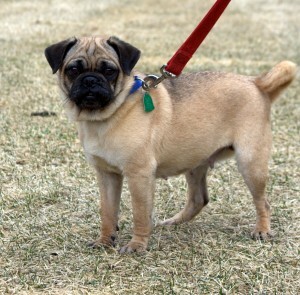 Claire is an energetic pug that loves people and would make a great companion for an active family.